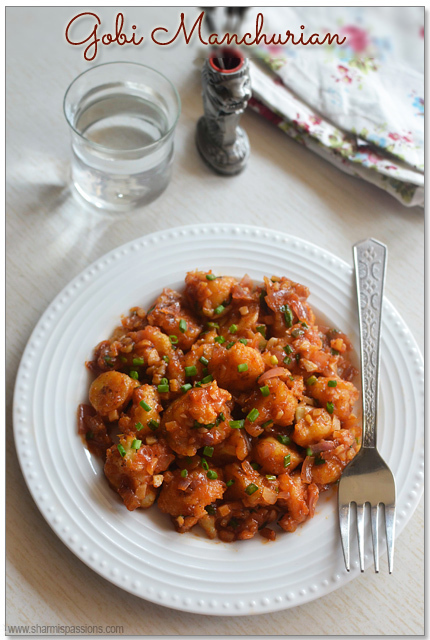 Gobi manchurian recipe with step by step photos. 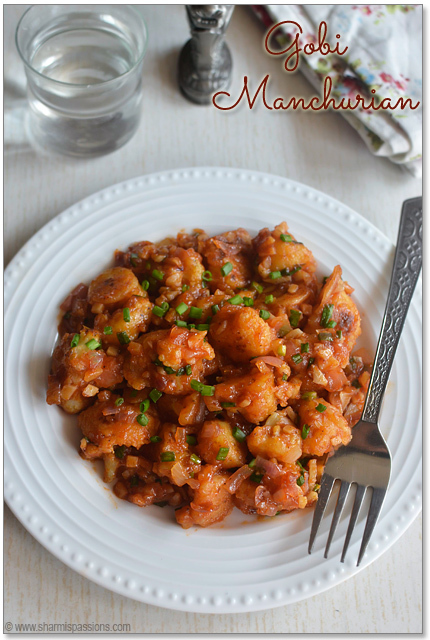 Gobi Manchurian is one of the very few indo chinese dishes that I love to eat in restaurants! Gobi manchurian is one of the popular dishes in many restaurants and most wanted recipe too.So here is how we can make gobi manchurian with easy stepwise pictures. 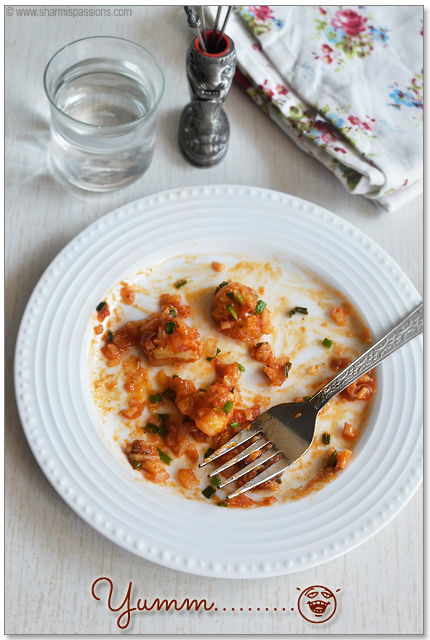 I have given the saucy version here but check my notes section for making gobi manchurian dry version. Mix all the above ingredients listed under ‘for the batter’ with little water to form a thick paste.Boil water and add cauliflower florets, salt and turmeric powder. Cook only till half boiled, drain water and keep aside. 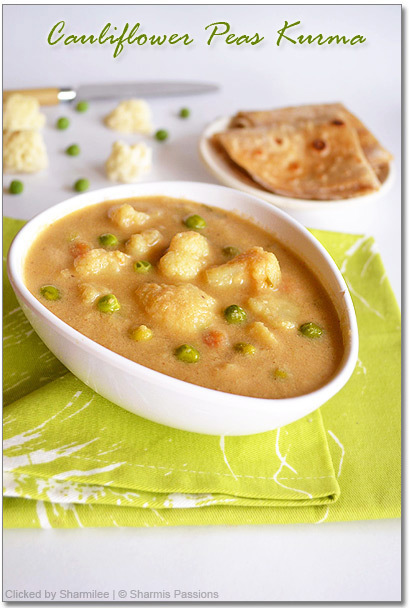 Marinate the boiled cauliflower florets in the batter, mix well and leave it marinated for 15 mins. 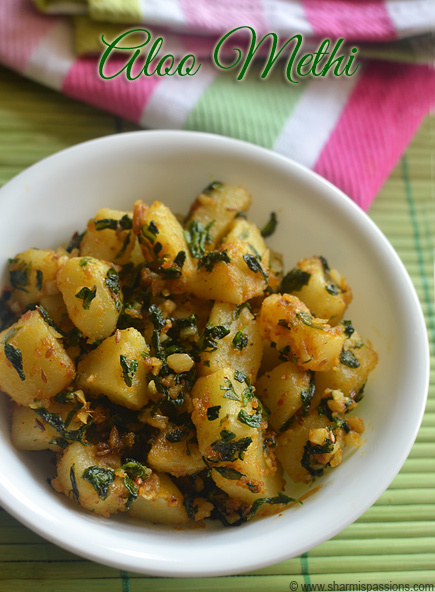 [I usually toast them in dosa tawa or grill them in oven.Then deep fry them till golden brown or until crispy. Heat oil and add sliced garlic,spring onion white part saute for 2 mins then add onion and saute till slightly browned. Now add the green chilli sauce, soya sauce mix well in high flame for a minute. Simmer,add tomato sauce and little water say 1/4 cup water, add cornflour water mixture of you are adding then allow it boil and come to a sauce consistency.Now add toasted/grilled gobis. Mix well again for 3-4 minutes for the flavours to get blended well with the gobis. The gobi pieces should be a little crisp and not soggy at this stage.Finally add pepper powder and garnish with spring onion green part and switch off. Garnish with spring onions while serving and Serve hot! Yummy saucy gobi manchurian is ready. To make a dry version just reduce the tomato sauce so that the gobis are just coated with the sauce. You can even deep fry the gobis for more crispy version. Also you can add 1/2 cubed capsicum after frying onions. Adding cornflour water mixture is purely optional – this is just to make the sauce thick.Serve immediately before it becomes soggy. why did you remind me of this wonderful dish! it’s my fav… and i want to have it right now. looks soooo good. U make me drool over ur manch! 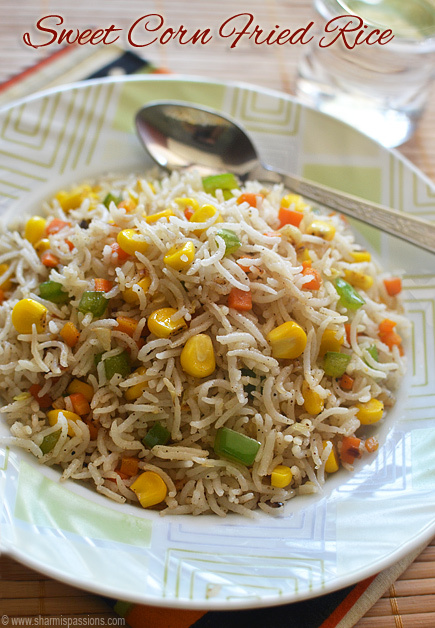 Simple one… Glossy Glossy Manchurians look yum… Slurp!!! 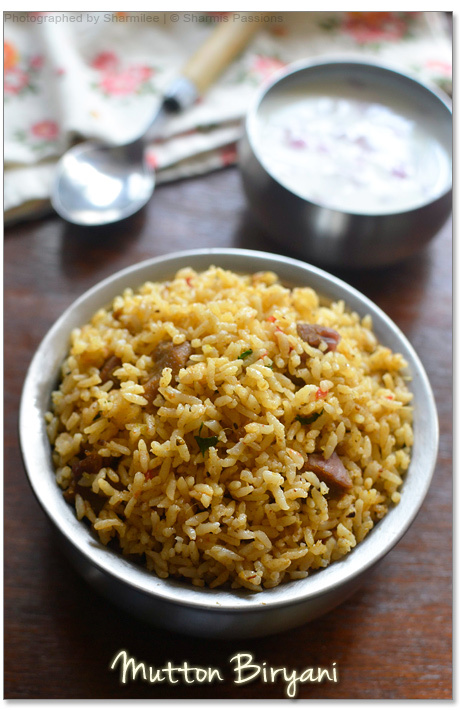 The manchurian looks good & simple to prepare also. 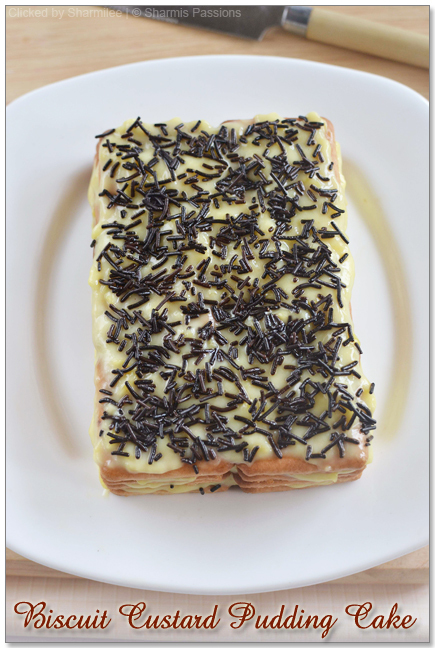 All time fav dish!Looks very yummy! I can never get enough of this.. looks so tempting. 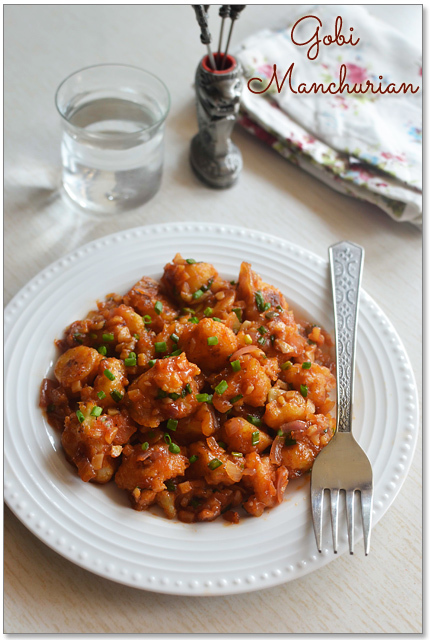 Looking at this manchurian that i prepare occasionally though our fav, is heart warming. Sometimes i use sambal oleak – chilli paste found in asian stores for this recipe. Love manchuria with any veggie..your looking yummy and simple..
We tried this tasty gobi manchurian.We had a lovely combo of chinest veg fried rice & gobi manchurian of yours.Taste was amazing for both &we all enjoyed it.Thanks for sharing this wonderful dish. Thank you Sharmi. 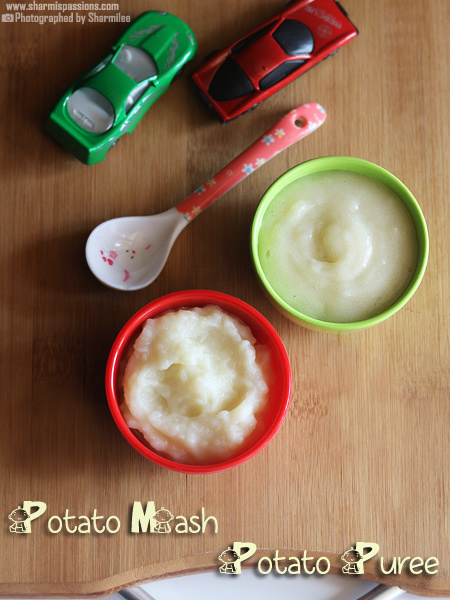 I have tried this recipe twice and both times it has turned out extremely well. The step by step method is very good. You are wonderful in writing, posting the pictures. wow.. very yummy looking . so nice..
how do you grill florets in oven? Can we use whole wheat flour instead of Maida & besan instead of corn flour ? Thank you Sharmilee. Is there a substitute for corn flour? No I dont recommend any substitute for soya and tomato sauce as it will totally change the flavour. which brand tomato sauce u use? hello mam. i prepared this manchurian. really yummy. is spring onion a must in ds recipie?